As our rug of the month July 2016 we like to present you the Karabagh Kilim Darween – a decorative rose floral rug made of 100 percent virgin wool. This charming piece is part of our Karabagh Kilim Collection, which provides a large selection of wonderful kilims. Every single piece is unique and therefore a valuable collector's item. 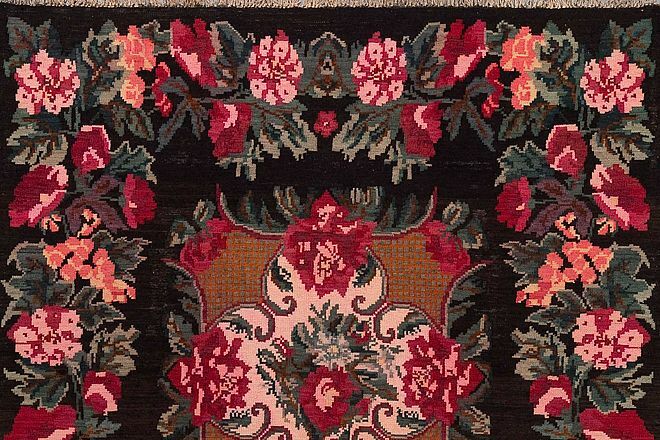 This semi-antique rose floral kilim has been manufactured around 1940 in the region of Karabagh, the so-called "black garden", in the Caucasus and preserved its special elegance to this day. DThe high-quality kilim, which is woven around the middle of the 20th century entirely by hand, shows the, for the region typically used rose and floral motifs. 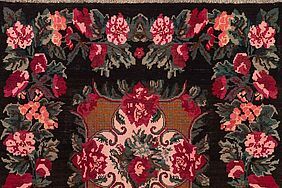 The combination of the floral motifs with the dark brown and black font creates the tasteful contrast, ensuring the particular and elegant appearance of our rug of the month. The model Darween from the Karabagh Kilim Collection is an exclusive, worldwide unique piece with a charming vintage appearance. Carpet enthusiasts from all over the world love those special kilims and like to decorate their living spaces with these wonderful collectibles. With its timeless elegance, the Karabagh Kilim Darween is suitable for classic as well as modern facilities. The kilim can be placed ideally in the living, dining or sleeping area. The traditional look and the iridescent colours of the kilim offer a stylish and exciting contrast to modern furniture. Thanks to the careful weave by hand and the use of high quality materials, the kilim is quite durable and easy-care. Mischioff’s rug of the month is an eye-catching unique that may be integrated into many decorating styles. The handwoven kilim is made of 100 percent pure virgin wool, dyed exclusively with vegetable colours. With its pile height of 3-4 millimeter it lies flat on the floor; thanks to the low weight of only 9 kilograms, it is easy to move back and forth. Order The Karabagh Kilim Darween For Your Range! Would you like to add the Karabagh Klim Darween to your assortment? Do you need more information about this wonderful collection? We are looking forward to your inquiry – please contact us and we will advise you comprehensively.